Seventeen sandy beaches lie either side of a headland crowned by the postcard perfect St. Bartholomew's Church, palm trees line the promenades and the winding streets of the Old Town are flanked by ancient fortifications and Art Nouveau buildings - check out the Cau Ferrat for a glimpse into the world of Santiago Rusinol. A Mecca for gay tourists, Sitges is also popular with families, romantic couples and city slickers from Barcelona looking for an escape. By day this is the perfect place for bronzing your body or taking a dip in the Mediterranean sea, whilst in the evening fashionable boutiques open their doors, before the crowds head to the town's famous restaurants and bars. The wild nightlife kicks on until dawn and beyond! Whether you're visiting Sitges for a day trip from Barcelona, or you're heading over for a hedonistic holiday in the sun (Sitges' micro-climate means the weather is even better here than elsewhere on the Costa Brava! ), at Sitges Life travel guide we aim to arm you with all the information you need. From practical info, such as hotels and apartments, airport transfers, travel tips and a map of Sitges to fun stuff like tourist attractions, a handy culture guide, and the best entertainment and tours! 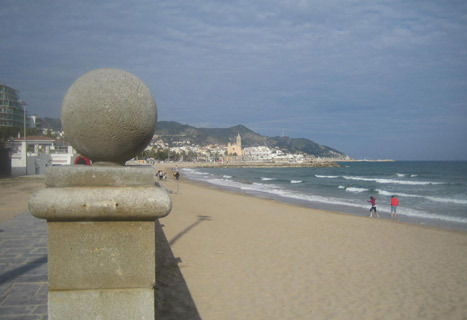 Of course many travel to Sitges for the big event, and this small coastal town certainly boasts more than its fair share, starting with the ribald Carnival celebrations in Winter, and including the Sitges Car Rally and of course the International Film Festival, which takes place in October. We'll keep you up to date with all the latest via our events calendar and news section. Our friends up the road have all the info you need on Barcelona, whilst we'll also get you the lowdown on our sunny neighbours Vilanova and Castelldefels. Did you know? Don Facund Bacardi i Masso, the Catalan wine merchant who went on to develop the world's most popular rum, was born in Sitges in 1814. Having set sail for Cuba in 1830, Bacardi revolutionised rum production when he set up his first distillery in 1862 in Santiago de Cuba. You'll find a monument to the man and his mixology on the Passeig Maritim - look for the hands in a circle crowned by the famous bat symbol.